Nothing stifles business productivity more than a cluttered and cramped office. Searching for misplaced files and documents eats up valuable time, and as piles of paper information build up, stress levels increase. Regular document purges keep your business efficient and profitable. 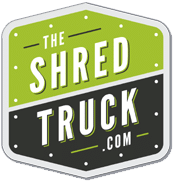 In this blog, we offer tips to help you organize a purge shredding day for your business. You can’t just haphazardly toss out information. A successful purge day requires a systematic approach for organizing and disposing of information. Make an inventory of the documents your business needs and how long they should be retained. If you don’t know your organization’s record retention requirements, consult with your attorney or accountant. When you’ve determined how long records should be stored and when they need to be destroyed, save all the details on a spreadsheet. Use the spreadsheet to verify what documents can and should be securely destroyed on specific dates. Since most of your documents contain sensitive and confidential information, you need to make sure they’re discarded securely. Contact a shredding and destruction provider in advance of your purge project. They will deliver locked, bar-coded collection containers to your office and place them in high-traffic areas. This allows your employees to purge confidential documents securely and in a matter of seconds. Your shredding and destruction provider collects the contents of the containers for professional destruction. After destruction takes place, you receive a Certificate of Destruction for your compliance records. A purge day offers the perfect opportunity to get rid of bulky file cabinets that take up valuable office real estate. After you’ve purged expired records from your file cabinets, consider scanning the documents you need to keep. Your digital documents can be stored and accessed on a local or cloud server, allowing you to ditch your file cabinets for good. A purge day shouldn’t be a chore; the more you do to make it fun for your employees, the greater the chance for success. Encourage casual attire for employees and order breakfast, lunch, or snacks. Take before and after photos and offer prizes for the most “transformed” work areas. With your imagination, the possibilities are limitless! 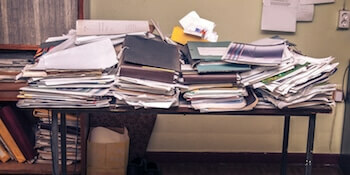 Regular document purges keep clutter at bay and decrease the need for large-scale purge projects. Quarterly or biannual purges are ideal since they can coincide with record retention and final disposition reviews. So, don’t wait to schedule your next purge, mark it on your calendar today! Another option is recurring scheduled shredding that takes place on set dates throughout the year. Locked collection containers are strategically placed throughout your office so documents can be securely dropped inside anytime. This also solves the problem of securely storing documents until your next purge project. For more purge day tips, please call us at 410-644-2600 or complete the form on this page.